Nonbearing Wall Rating — 1/2, 3/4 or 1 HR (See Item 4). 1. Steel Angles — 2-1/2 by 2-1/2 by 1/4 in. structural steel attached to masonry with 1/2 by 1-1/2 in. masonry anchor bolts. 2. Building Units* — insulated steel panels, 24, 30 or 42 in. wide. Attached through retainer clips to horizontal supporting angles with No. 14 by 1-3/4 in. hex washer head self-tapping screws located at each joint in the concealed lip of the building unit. CENTRIA, A DIVISION OF NCI GROUP, INC — Formawall Dimension Series, Formawall Dimension Series Graphix, Versapanel 1.75", 2.5", 4"; Versawall 2", 2.5", 4". KINGSPAN INSULATED PANELS INC — Types 200, 300, or KS series. 3. Flashing Angles — 2-1/2 by 2-1/2 in., No. 20 gauge coated steel attached to masonry with 1/4 by 1-1/2 in. nail in masonry anchors spaced 24 in. OC and 2 in. from ends. Vertical and horizontal (upper) flashing attached to building units with No. 14 by 1-1/2 in. hex washer head self-tapping screws spaced 24 in. OC and 2 in. from ends. 4. Gypsum Board* — Any 5/8 in. thick UL Classified Gypsum Board that is eligible for use in Design Nos. L501, G512 or U305. Nom.5/8 in. thick, with square or tapered edges. Applied vertically or horizontally, unless specified below, with joints staggered min 6 in. both directions. Attached to building units with Type S-12 Phillips bugle head steel screws 1-5/8 in. long for the first layer, 1-7/8 in. long for the second layer and 2-1/8 in. long for the third layer (if needed). Screws spaced 21 in. OC horizontally and 12 in. vertically with screws located 3 in. from edges. For 1/2 Hr rating-Fire exposed to either side-Two layers are required. For 3/4 or l Hr rating-Fire exposed to gypsum board side only-Two layers required. 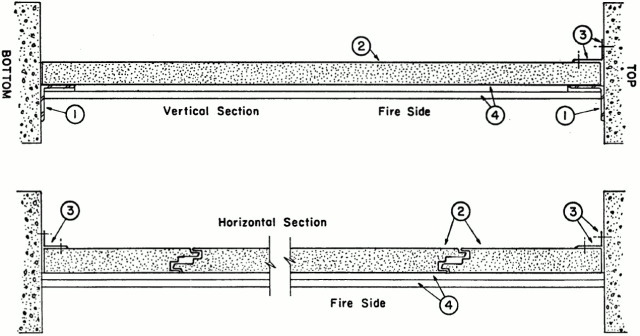 For 3/4 or l Hr rating-Fire exposed to either side-Three layers are required. 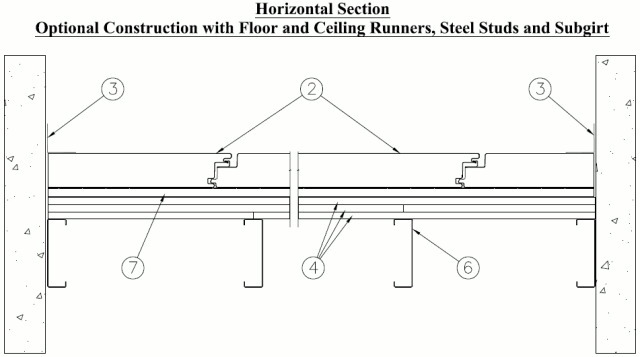 When Items 5, 6 and 7 are used, three layers of gypsum board attached vertically or horizontally to steel studs (Item 6) and floor and ceiling runners (Item 5), with joints centered over studs. First layer attached with Type S-12 Phillips bugle head steel screws 1-5/8 in. long, spaced 24 in. OC. Second layer attached with 1-7/8 in. long screws, spaced 24 in. OC. Third layer attached with 2-1/8 in. long screws, spaced 12 in. OC. Joints and screws staggered between layers. Rating is limited to 1 Hr, with fire exposed to either side. 4B. Gypsum Board* — (As an alternate to Items 4, 4A) — Nominal 5/8 in. thick, 4 ft wide panels, applied vertically only and secured as described in Item 4. 4C. Wall and Partition Facings and Accessories* — (As an alternate to Items 4, 4B, 4C) — Nominal 5/8 in. thick, 4 ft wide panels, applied vertically only and secured as described in Item 4. 4D. Gypsum Board* — (As an alternate to 5/8 in. Type FSW in Item 4) - Nom. 5/16 in. thick gypsum panels applied vertically or horizontally. Two layers of 5/16 in. for every single layer of 5/8 in. gypsum board described in Item 4. Horizontal joints on the same side need not be staggered. Inner layer of each double 5/16 in. layer attached with fasteners, as described in item 4, spaced 24 in. OC. Outer layer of each double 5/16 in. layer attached per Item 4. 5. Floor and Ceiling Runners — (Optional, Not shown) — Channel shaped runners, min 3-5/8 in. wide, min 0.020 in. thick (25 ga.) galv steel, attached to floor and ceiling with fasteners spaced 24 in. OC max. 6. Steel Studs — (Optional) — Channel shaped, min 3-5/8 in. wide, 1-1/4 in. legs, 3/8 in. folded back returns, min 0.020 in. thick (25 ga.) galv steel, spaced 24 in. OC max. Studs to be cut 3/8 in. less than assembly height. 7. Subgirt — (Optional) — Hat or "Z" shaped subgirts, min. 1/2 in. deep, min. 0.045 in. thick (18 ga.) galv steel, spaced 48 in. OC and attached through gypsum board to steel studs (Item 6) with 3 in. long, No. 14 self-tapping screws or No. 14 self-drilling screws. Building units (Item 2) securely fastened to subgirts with No. 14 hex head self-tapping screws through retainer clips at each joint in the concealed lip of the building unit.